底下的选项会根据性别的选项而显示。本次比赛部分年龄段。这个条目只用来采集参赛者的年龄情况。There is no age limitation for the competition. Data collected here is for information only. 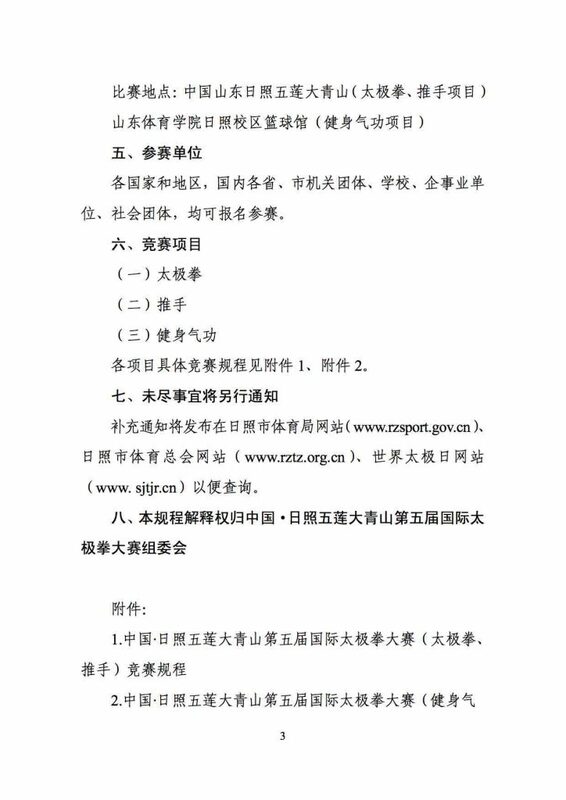 *你只可以根据情况选择一项。十人以上配一个领队和一个教练教练。领队和教练免费接待。领队不能参加比赛。教练可以是运动员兼任。|You can only choose one item. Only a team with more than 10 people qualify to have a team leader and coach. Team leader cannot compete. The coach can compete. The designated team leader and coach do not have to pay any fees. 信息会被加密保存。|This information will be kept securely. 2017.10.27报到，31日下午离会。Registration is on Oct. 27 and departure is on Oct. 31 pm. 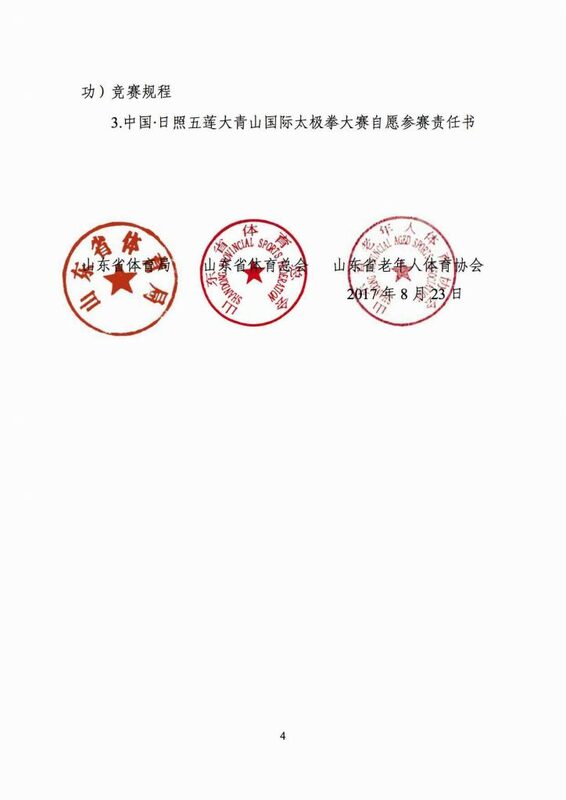 *注：健身气功将在日照市日照陈中华太极馆举行。Qigong will be held in Riizhao Chen Zhonghua Taiji Academy. 每队6人以上（男女不限），6人以下每少一人扣0.2分。拳、械、拳械混合均可。可以配乐（音乐自备，不能带歌词）。同类拳种、器械集中编组。凡每一拳种、器械不足5人时均集中编为其他拳种、器械类。| Group forms: Each team is made up of 6 people (no gender restriction). If less than 6 people, 0.2 point will be deducted for each missing person. 1. 普通会务费100元。Normal registration is 100 yuan. 2. 学生会务费50元。学生凭在校学生证，包括大学。Student registration is 50 yuan. Students require current student id. 3. 当代太极各门派优秀传承人评选（青山名人堂）每人缴纳300元。Qingshan Taiji Hall of Fame 300 yuan. 1. 普通报名及食宿220元一天，住大会指点的五莲县城宾馆。四天共880元。付款时可以按实际住的天数计算。大青山离五莲县城距离8公里。880 yuan normal. 2. 1400元 住大青山国际村公寓+三餐。1400 yuan at International village. 3. 2200元 住大青山王廷准三星宾馆+三餐。2200 yuan at Daqingshan at three-star equivalent. 4. 2800元 住大青山国际酒店+三餐。2800 yuan at International Hotel on Daqingshan. 5. 4999.00 VIP限十人。大床饭或单人住标准间，专人服务，三餐独立包间，可以使用大会名家、贵宾休息室。观看比赛安排专座。4999 yuan VIP single room and shaperoned and eat in special rooms. Share reception room with masters and special guests. Special seating arrangements at the competition. 食宿费概不退还。No refund or cancellations. 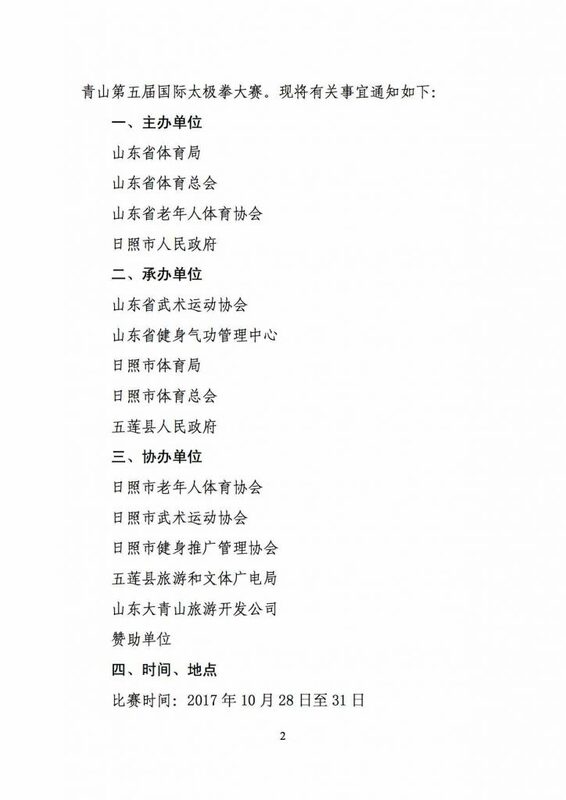 当代太极各门派优秀传承人评选（青山名人堂）申请者简历上传 Info for Daqinshan Taiji Hall of Fame applicants.